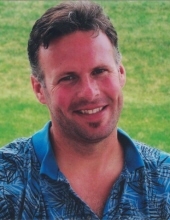 Michael Noel Greisiger passed away on Friday, January 18, 2019 at the young age of 50. Michael was born on January 11, 1969 to Judy (Broxon) Greisiger and David A. Greisiger. Michael graduated from Maumee High School where he was a starting varsity basketball player for three years during which time the team won three consecutive NLL titles and was undefeated during the 1985 season. He also attended the University of Toledo. Michael was a huge Ohio State Buckeye and Pittsburgh Steelers fan. Michael worked in the landscaping business for 20 plus years in addition to working for several construction contractors. He grew up and lived in Maumee, OH most of his life and relocated to Columbus where he resided for 17 years until returning to the Maumee area in 2017 to be close to family while he fought his battle with cancer. Michael was a gentle soul and his sense of humor was contagious. His impersonations of TV and movie characters and ability to remember one liners of every movie he watched kept those around him laughing to the point of tears. Michael is preceded in death by his father, David A. Greisiger. He will be sadly missed by his mother, Judy (Nolan) Sheperd of Maumee; brothers, David (Kathy) of Toledo, Jeff of Port Charlotte, FL, and Aaron (Jacki) of Maumee; nieces Chloe, Kendall and Jadyn; nephews, Shawn, Braiden, Zachary, Sam and Cahle; his loving companion, Beth and her daughter, Allison; step-sisters, Robin (Tom), Stacy and Heather; and a host of nieces and nephews. In addition to his family, Michael will be missed by his long time, dear friends, Paul, Chris, Carol and Dan, as well as many others. Everyone’s outpouring of love and support during this difficult time meant a great deal to Michael and his family. The family would like to give a special thank you to Hospice of Northwest Ohio for their special care over the last few weeks. A memorial in honor of Michael’s life will be held on Saturday, January 26, 2019 from 1-4 p.m. at Capers Restaurant, 2038 S Byrne Rd. In lieu of flowers, the family requests that you make a contribution to the charity of your choice. To plant a tree in memory of Michael Noel Greisiger, please visit our Tribute Store. "Email Address" would like to share the life celebration of Michael Noel Greisiger. Click on the "link" to go to share a favorite memory or leave a condolence message for the family.